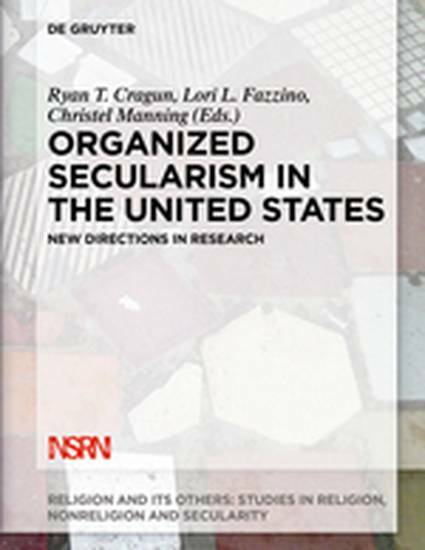 "Organized Secularism in the United States: New Directions in Research" by Ryan T. Cragun, Ed. There has been a dramatic increase in the percentage of the US population that is not religious. However, there is, to date, very little research on the social movement that is organizing to serve the needs of and advocate for the nonreligious in the US. This is a book about the rise and structure of organized secularism in the United States. By organized secularism we mean the efforts of nonreligious individuals to build institutions, networks, and ultimately a movement that serves their interests in a predominantly religious society. Researchers from various fields address questions such as: What secularist organizations exist? Who are the members of these organizations? What kinds of organizations do they create? What functions do these organizations provide for their members? How do the secularist organizations of today compare to those of the past? And what is their likely impact on the future of secularism? For anyone trying to understand the rise of the nonreligious in the US, this book will provide valuable insights into organized efforts to normalize their worldview and advocate for their equal treatment in society. Cragun, R.T., Manning, C., & Fazzino, L.L. (eds.) (2017). Organized securalism in the United States: New directions in research. Fairfield: Walter de Gruyter GmbH.